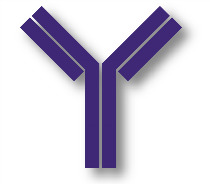 The CD117 (c-Kit) antigen is the cell-surface receptor for stem cell factor (SCF). 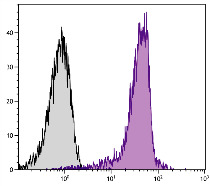 Together these molecules constitute a ligand/receptor pair which functions to maintain normal hematopoiesis in the adult. Signaling through SCF/c-Kit has an important role in stimulating myeloid and erythroid production of primitive hematopoietic progenitor cells. A variety of cytokines act synergistically with SCF to stimulate proliferation and differentiation of bone marrow progenitor cells. 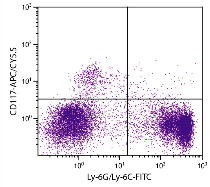 For example, SCF plus IL-7 can stimulate the combined myeloid and B cell differentiation of uncommitted hematopoietic progenitor cells. 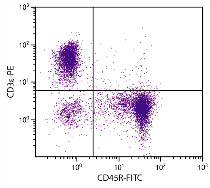 SCF/c-Kit also participates in erythropoiesis in both the bone marrow and spleen. 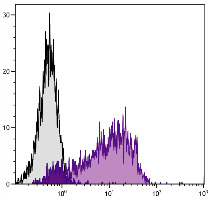 Loss-of-function mutations for SCF/c-Kit lead to a variety of pleiotropic developmental defects while gain-of-function mutations can lead to constitutive activation of the kit receptor and links to cancer. 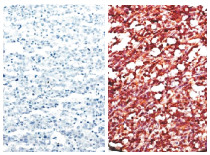 Examples of the former are mast cell deficiency and severe macrocytic anemia while the latter mutation has been identified in mastocytomas. 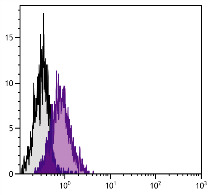 BALB/c mouse bone marrow cells were stained with Rat Anti-Mouse CD117-APC/CY5.5 (SB Cat. No. 1880-18) and Rat Anti-Mouse Ly-6G/Ly-6C-FITC (SB Cat. No. 1900-02).